Alphas aren't elected; they're self-selected. Life has been good since Paul McHew left his werewolf pack twenty years ago and married Susan. Patrick is the eldest of their four children and feels the pull of the full moon earlier than his father had. Patrick itches for the city, but things have changed since his father's time. The economy is booming and everyone has a smart phone. But in a post 9-11 world, where security cameras abound, everyone is being watched. Patrick must make the city streets his own as the eldest of a new generation. 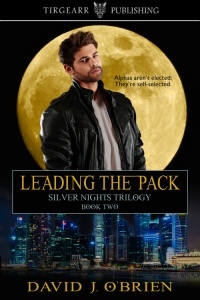 To do that, he must learn to control his own impulses, and those of his pack mates, if he hopes to become their leader. Encountering a potential mate and facing a definite rival, can Patrick be the alpha everyone expects him to be? The man watched the hare graze calmly across the closely-cropped paddock. In the silver light of the full moon, he saw its nose twitch as it scented the wind. Crouching low, he stalked closer. Off to the left, cattle snuffled; somewhere beyond he heard the click of a deer stepping on a dry twig in the woods. Right of the hare, a badger dug for worms and grubs. He ignored them. He could not easily take down a cow alone. The bull would make it difficult, would come to the cow’s defence, and the herd would mill about him. While he could avoid their horns, he would not be able to suffocate the cow, or bleed it out unaided. And the man did not want company; not that kind. The hare would be sufficient to satiate his hunger. For now. His quarry just ahead, its eyes reflecting the bright moonlight, the man crept forward. His long hair swept over his forehead, closing off much of his peripheral vision. Though naked, the thick hair that covered his chest and extended over his back and shoulders insulated him from the breeze. He felt the soft grass stems between his toes, digging into them for a greater grip on the soil beneath. The hare turned away from him. The vision that might have helped warn it of the naked human’s approach was at its weakest, and the man took advantage of that. The next thing he was aware of was kneeling on the ground, the dead animal in his hands. Its neck was broken, its ribs crushed. A small trickle of blood dripped from its nostrils. The man could not remember how it happened. It had taken place too quickly for him to have time to think about it, for it to register in his consciousness. There was only action; automatic and reflexive. The hand and the body, were, indeed, quicker than the eye. The information had reached his brain, but not the part involved in conscious thought. It looped through the cerebellum and brain stem back to his muscles as they powered him forward upon the unsuspecting animal. Only when the body’s work was complete and the prey caught, did the brain once more return to the luxury of thinking, allowing the man to surmise the events. He had run four yards faster than his thoughts could keep up and grabbed the animal as it started to flee. He’d dived upon it and pinned it to the ground with the full weight of his body. Death had been instantaneous. The man lifted himself up and held the limp animal by the ears. He exposed the throat. With his two left canines he ripped a hole through the soft skin. Blood started to drip. He put the opening to his mouth and sucked up the flowing liquid. Then he lifted the body up over his head and raised his mouth to drink it all, taking the legs between his fingers and pulling, to push the blood through the limbs and torso. When the corpse ceased dripping, he put his fingers through the hole and ripped off the head, tossing it aside. Then he pulled the skin back off the muscles in one piece. The animal skinned, he bit into the muscular back legs and tore off strips of raw meat. Barely chewing, he swallowed hard on the flesh and walked through the paddock under the moonlight. He caught the scent of the cattle and deer on the wind and, coming from the other side of a hill, heard the neigh of a horse, then a long, drawn out howl. He grinned to himself. The blood still on his lips dripped to his chin. The animal consumed and his stomach filled, the man wondered what to do now that particular desire had been satiated. A voice whispered to him.